If you’re looking for a Louisiana based, ISA Certified Arborist in New Orleans or Baton Rouge, you’ve come to the right place. With more than 12 certified arborists on staff and arborists running our company, you won’t find another company as qualified or experienced to care for your trees as Bayou Tree. When properly cared for, your trees are a tremendous asset to your home or business. When neglected, they become a serious liability. 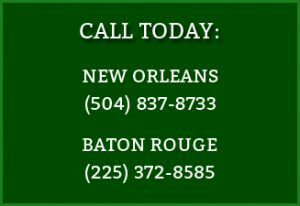 If you’d like to schedule a consultation with an arborist, please contact us today in New Orleans or Baton Rouge. We maintain offices with full staff in both locations to better serve our diverse local, Louisiana clients. We carry out each of these services with our own brand of Bayou Tree Service. Some companies might describe it as “white glove” treatment. We’d say it’s just another day at the office. It’s the little things you’ll notice…like taking extra care to prepare your yard or groups before we begin work to ensure your property isn’t damaged unnecessarily. And when we’re done, we like to leave your yard in better condition than we found it. It might be giving you a written estimate with proof of insurance, then completing the job at the quoted price. Or maybe you’ve got an idea about something you’d like to do with your tree but it might cause damage or even kill the tree. If that’s the case, we’ll tell you. We want to make sure you’re aware of the risk before taking any action. Safety, timeliness, expert tree care, transparency & honesty. Those are the values you can expect from Bayou Tree Service! Bayou Tree Service is locally owned and operated since 1980. Our experience dealing with local, Louisiana tree issues includes everything from palm trees (including Texas Palm Decline), to Formosan termite damage, maintaining large privacy hedges to preserving Historic Live Oaks around New Orleans and Baton Rouge. From homes to university campuses, golf courses to homeowners associations, parks to downtowns, we’ve seen almost everything that Louisiana’s unique tree canopy has to offer. One of the main reasons we chose a Live Oak tree for our logo is that few symbols embody life in this area quite as well. Live Oaks run throughout south Louisiana from the historic campus of LSU and Highland Road to the Plantations along the Mississippi River to St. Charles Avenue and the Garden District in New Orleans. We care for many Historic Trees for our residential clients across the area. However, we work even harder to preserve those trees in commercial areas including educational campuses, municipalities and other organizations. Our team also works alongside a number of local architects, landscape architects and city planners to develop and enhance tree preservation guidelines in project specifications and in city code. If your city, school, organization or business needs a professional arborist in Baton Rouge or New Orleans, please check out list of selected projects and contact us for a consultation. Do You Need an Arborist, Landscaper, or Just a “Tree Guy”? A quick search for arborists in any local market will turn up all sorts of competition from tree companies all over the internet. What does that mean for you? And how do you know if you need an arborist, a landscaper, or what we’d call a “tree guy”? Our organization is run by arborists and not corporate types, so each day our focus is on protecting the health and safety of our clients and team as well as preserving and caring for trees. After all, we’d rather be up in a tree than sitting at our desks! What do you get when you hire an arborist? ISA Certified Arborists have more than just experience in the field. In order to earn this certification, they must demonstrate knowledge in both the art and science of tree biology. They then validate this competence by passing the exams necessary to become certified. As a consumer, you get the benefit of that education and experience when it comes to protecting and preserving your local trees. Our team has 40+ years of experience studying our local trees, identifying threats and pests and knowing what it takes to not only keep those trees healthy, but to protect the safety of those around the trees. An inexperienced tree trimmer may plant a tree at an incorrect location, in the wrong soil or light conditions, or trim it excessively. Any of these mistakes can easily damage or even kill a tree. Professional arborists, on the other hand, are trained to adhere to pruning and care standards, carry liability insurance and understand the importance of proper safety procedures. Membership in organizations such as TCIA (Tree Care Industry Association) and ISA (International Society of Arboriculture) Certification are more than just logos displayed on a website. The TCIA is a trade association of 2,000+ tree care firms around the world devoted to safety and education as well as improving standards of tree care practice and management. The ISA is another organization founded to improve the knowledge of the care of trees. Today, the organization has 20,000+ members and the ISA Certification is considered the industry standard in tree care certifications. Additionally, each organization maintains their own strict code of ethics. In addition to these 2 industry associations, Bayou Tree actively donates our time and expertise to dozens of local organizations across southern Louisiana to help preserve our local tree resources. If you’re ready to request a consultation with one of our Louisiana certified Arborists in New Orleans or Baton Rouge, please call us today!